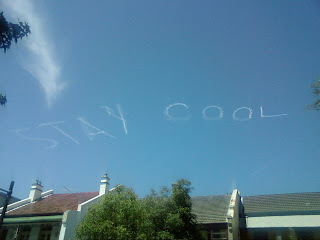 Skywriting: a really wasteful way to write. 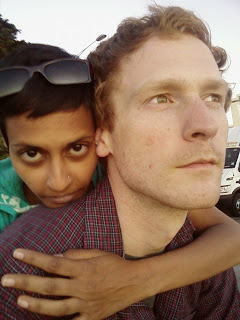 First off, here's what Craig and I look like these days. I've been having the best time, y'all! I haven't been in town for two whole weekends; I love getting out of Sydney...leaving Sydney might be my favourite part of being here at all. 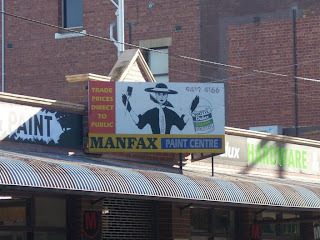 Oh, and my other favourite part is the Sydneysider who's been taking skywriting classes. Skywriting has got to be a dying art, right? And, if no one says anything else about me when I die, I want people to say I was always charmed by practitioners of the dead and dying arts. ...wait for it... that's right, it's the largest aluminum structure in the Southern Hemisphere! It may not seem that impressive, but compared to Canberra's other great glory**, it's pretty fantastic. It's atop the Parliament building, I think, which is a pretty neat building anyway. It was designed with this huge grassy lawn that goes up to the top of it, and it was intended as a symbol of democracy. Anyone and everyone could walk onto the Parliament building; Paul remembers rolling down the hill during school field trips to the capital. However, in a post-9/11 ironic twist, everyone is now barred from the the lawn--to protect democracy from terrorism. 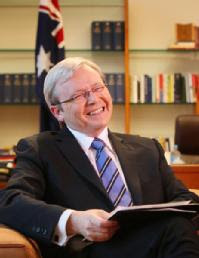 I find it pretty hard to believe that Kevin Rudd's chipmunk adorability could inspire violent ire. **It's also got the largest gathering of polite public servants in the Southern Hemisphere. 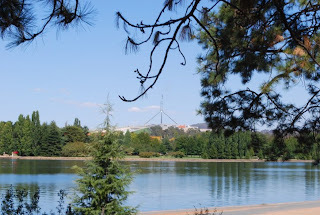 Part of visiting Canberra was to see if I liked it enough to try to go to school there. Everyone in Sydney says it's approximately the most boring place in the world. But people in Sydney haven't visited Marietta, GA, now have they? Turns out, Canberra's fine. It's quiet and smells like eucalyptus. It's dry and people grow a lot of native flora. It's got a big man-made lake and some national buildings of dubiously attractive structure. There's a nice coffee shop and some ok bars. It's not as convenient as Sydney is, and I have gotten awful accustomed to the convenience of this city. But hey, there's arty stuff and I think, because I would be studying, it would be ok. It's got the best research resources in the country. And I'd still only be a three-hour bus ride from Sydney. Paul and I visited the campus of ANU, my prospective school. It's a large, quiet, flat sprawling campus, perfect for riding a bike around. We did almost everything there is to do in Canberra: we rambled through the overwhelming and large National Museum, we spent some time at the National Film and Sound Archive. I saw some lovely wartime advertisements about how the Australian ladies were filling the gap left by the men--and how cute do they look on the job!! Women are ticklish, it turns out. I've said this before, I know, I know, but once more-- Australia seriously knows how to put together a museum. I mean, every single one I've been to, every exhibition, even little ones, has been well-researched and well-presented and fascinating. At the National Gallery, I got to see an original Jules Cheret poster and a bunch of Picasso and Daumier--wicked. Since we've been in Sydney, I have felt the significant lack of large swathes of Atlanta's population. There are relatively few Jews in Sydney, mostly just concentrated around Bondi, which also–incongruously–features a high concentration of surfer dudes and is, therefore, best avoided at all times. There are almost no African-Americans! What's with that??! I'm such a card. But, and pay attention, because here is where I get to the point-- there are no Ethiopians in Sydney. Which is to say, there are no Ethiopian restaurants in Sydney, and as many of you know, I used to regularly force any number of y'all to go to Meskerem with me. I can't believe I never held a Nijaween there. Anyway, I've been doing without my usual fornightly fix of Ethiopian food, but no more! Canberra is home to the only Ethiopian restaurant this side of Uluru, and luckily my pal Paul indulged me in this craving. He invited his housemate, Taneesha, and some of their friends out, and we had a lovely dinner. The whole weekend was kind of bittersweet, as I won't get to see Paul for awhile now. He's moving back to Geneva this month, but at least I have an excuse to go to Geneva! 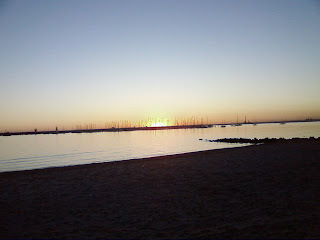 And Melbourne this past weekend was wonderful! We enjoyed vegan Tom Yum soup at our favourite Melbourne joint, and we also visited a donation-only restaurant called "Lentil As Anything." A really wonderful concept, where you pay what you can for good vegetarian (or if you're Australian, vego) food. A Slow Food Farmers' Market rounded out a delicious weekend. 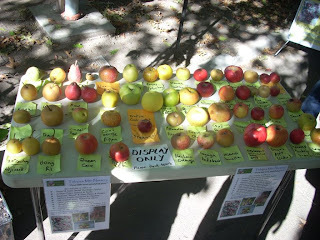 Look at all these apple varieties! But Melbourne's not just about food: we also visited the beautiful State Library of Victoria, featuring an enormous dome-shaped hushed and still reading room, with balconies full of books surrounded by exhibitions focussed on the evolution of the book. 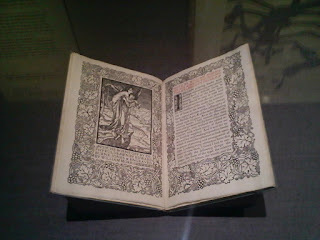 The exhibit started with an original leaf from a Gutenberg Bible and an original publication by William Morris and the Kelmscot Press. I love the printed page, the smell of books, the beauty of words, words, words, black as night on the creaminess of a clean page; the richness of my life is forever indebted to their work, and I was very excited to see that even this lonely, isolated and distant place has such evidence of our civilisation's history on display for all. The exhibition even had a section on artists' books, which are such evolved artforms you can't quite call them books sometimes. In fact, the book-arts are quite developed in Australia; I've been to two state libraries that featured exhibitions on them, and another exhibition put on by an art gallery. And Melbourne. Everyone loves Melbourne, it's got loads of street art, and everyone's fashionable. It's got trams, the streets are made of diamonds and everyone's pretty. 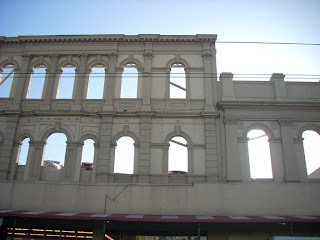 I've got to say, Melbourne is a damn charming city, though–even the car parks are attractive. The hardware stores are hip; though not as hip as a certain Ace Hardware during the summer months of...2006, was it? Now we're back in Sydney. And I still want Ethiopian food; lucky for me, Craig and I have just figured how to make Ethiopian berbere, Misir Wot, Gomen Wot, Kik Alicha, and an awesome Vegan Tom Yum Soup!! I've put stuff up here before about the printmaking collective I'm getting involved with-- it's called the Rizzeria, and it's all based around stencil press printmaking. I just finished the Mastercourse, and check out the beautiful poster I made! 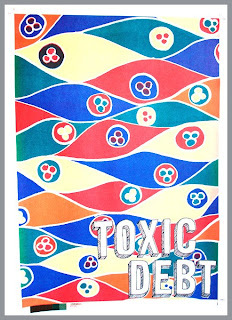 It's inspired by Macquarie Dictionary's Word of the Year: Toxic Debt. The RISO machine is so much fun, like screenprinting, but at 120 pages/minute. Just call me speed demon. We also played around with GOCCO machines in the class; they are just as fun as the RISO, though significantly slower. 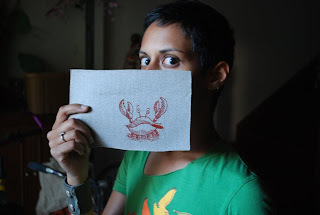 I printed the crab on brown primed canvas using red RISO ink on a GOCCO stencil press. I liked the GOCCO so much, I ended up buying one for my personal use! The crab was drawn by Craig, and it's becoming a bit of a personal logo for him; he's even started spelling his name krb. Total insanity. This past weekend, Paul ( from this post ) came to town! He's been working for Australia's Immigration Department in Canberra. It was sort of bad that he came, because he was getting his visa to move back to Geneva; but it was still really nice to see him and hang out in Sydney. We took him on what we're starting to call "The Craig and Nija Awesome Food Tour of Sydney." I really enjoyed showing him around; it's strange, but somehow showing a friend around Sydney make me feel like I really know this place...like it might be home. I don't know everything about it, I haven't seen all of it. But I'm sort of starting to get it. This coming weekend, I'm going to Canberra to see his town and hang out with him one last time before he moves back to the opposite quadrant of the world. I'm also going to check out ANU; I've been researching a few Master's programs, and it looks like ANU might have the best programs for me. I've heard a lot of bad things about Canberra, so I'm interested to see it for myself. I've heard it's really boring and spread out, it's the world's first planned community, it's like living in a park, and there's just not much life to it. I've also heard Canberra's a lot quieter than Sydney. Honestly, right now, as I'm listening to my neighbour's blaring television, people screaming at the bus stop right outside my front door, trucks and buses groaning by, and unmuffled motorcycles rage past, quiet sounds like it might be a really nice place to be. Lately lonely lovely lamely lucky me. It's been 8 months since we moved away, away, and oh, so far. I miss my community, my home so much. I miss you all, and I wonder how people do this, how they leave a whole adult life for somewhere else. A few weeks ago, the Sydney Theatre Company put together a tribute to Harold Pinter; Cate Blanchett and a few other brilliant actors conducted live readings from his oeuvre. It was a wonderful afternoon; we got to see Cate Blanchett in all her vibrant glory on a small stage, with an audience of about 800 people. We were inspired to read more Harold Pinter, we decided we should give theatre another chance, and we felt so damn cultured. Well, as cultured as you can feel after you waited about 2 hours in a very long line to get into a free event. Last weekend, Craig and I went to Tropfest with a bunch of international students from UNSW. Craig managed to get a gig as an International Student Services mentor, and I just found out today he's been offered two other part-time jobs at school, too! Watch out for news of his first refereed conference coming up soon–Academia Australiana is about to be shaken up by a punk rockin' ginger. Tropfest is the world's largest short film festival; it started at the Tropicana cafe, which is somewhere in Brisbane (pronounced "briz´bun"), and ended up taking place in Sydney, getting broadcast to all of Australia, and has just begun a spin-off festival in New York. It's outdoors, it's free, and it's very corporate. Since it was our first year in Sydney, we figured it was worth a shot. All my previous experiences with outdoor film in Atlanta were awful; people drunk and loud, not watching the movie and making it impossible for me to watch the movie. Tropfest, on the other hand, was lovely. You could hear every word, every sigh, every intake of breath. You could hear people listening. It was a nice night, and some of the movies were even pretty good. You can watch the 16 finalists for Tropfest 09 here. An interesting thing about Sydney is how much illegal underground stuff goes on here; on the same night as Tropfest, a collective known as SquatSpace held their own film festival; they set up a projection system illegally, in some abandoned warehouse or forgotten space, and they show DIY films made by directors who aren't looking to be accepted by the mainstream. It's seriously illegal, too; they couldn't release the location until the day of the event, and even then only through SMS, to keep the cops from shutting it down before it got started. The amazing thing is that even though it's an illegal festival, put together by a bunch of anti-establishment artists and rent-defaulters, the Sydney Morning Herald ran a positive review about it right next to the article about Tropfest! The founder of Tropfest even takes the competition well, saying if he hadn't put Tropfest together, he would've loved to do something like Squatfest. I think we'll try Squatfest next year; that sounds pretty lovely, too. My arm has been hurting a lot in the past few months; I hurt it years ago working at the JavaMonkey, but it's been getting worse. It feels like everything I do exacerbates it. I've had days where I couldn't even type without serious pain. I've talked to several Western doctors about it, and have been told that other than painkillers, there's no real way to heal a repetitive stress injury. But I don't believe them anymore, because as far as I can tell, Western medicine seems built on some wild principles. And I feel so lucky, because my life in Sydney is so bountiful. In Sydney, I have access to the most amazing food from a beautiful co-op, I have been getting very cheap acupuncture for my long-suffering arm, free counselling from the university for feeling so lost, so far away, I have gotten involved with a printmaking collective and am learning how to print on a RISO machine. Stencil presses are my new love. And I guess maybe this is how it happens; people leave a whole adult life somewhere, and find something beautiful whereever they end up. And that is really something to wonder about. I'll be posting more of my radio segments and recent prints/artwork soon. ps-- on Saturday night, we went to a midnight beach party at La Perouse. The bay was beautiful, the waves were soothing, and the warm felt warm on my feet. We listened to Fela Kuti and watched Aaron build a bonfire. A pretty magical night.